Chien-Tang Wang was born in Taipei County, Sanchong Taiwan in 1986. He started learning to play the violin at the age of five, and has graduated from music classes at the Bi-Hwa Elementary School, Ren-Ai Junior High School and High School of the National Taiwan Normal University. 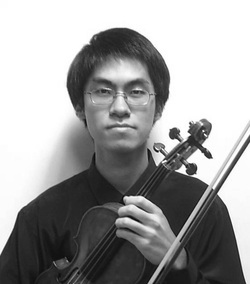 Chien-Tang is currently a junior in the music department at National Taiwan Normal University, and is majoring in violin under Professor C.Nanette Chen. His past teachers include Mr. Chuan-Huang Wang, Mr. Chun-Hsiung Lin and Mr. Hsi-Lung Hsu. Chien-Tang has participated in master classes with several famed masters, including Yao-Ji Lin, Michael Ma, Nai-Yuan Hu, Keng-Yuan Tseng, Eric Rosenblith, Lynn Chang, James Buswell, Yehonatan Berick, Anton Miller, Young-Nam Kim and Mikhail Kopelman. Chien-Tang continues to participate in various musical performances and competitions, striving to uphold excellent performances and continue to become a better performer.